Red Sox considering former GM, Ruben Amaro, for first base coach, but should they? Nick Cafardo of the Boston Globe reported yesterday that the Red Sox hired Ruben Amaro Jr. to replace Arnie Breyeler as first base coach. It appears former Phillies GM Ruben Amaro Jr will become Red Sox first base coach. Shortly thereafter, Rob Bradford of WEEI.com confirmed Amaro was a finalist for the job, but cautioned the Red Sox had not made a decision. The Red Sox have also yet to make an official announcement on the hire. Whether or not the Red Sox have made a final decision on Amaro, everyone agrees he is at least a finalist for the job, which quite frankly is a surprise in its own right. Amaro, an outfielder, played eight years of Major League Baseball for the Angels, Indians, and Phillies, with whom he finished his career in 1998. Amaro joined the Phillies front office in 1999 as their Assistant GM, and was promoted to GM in 2009, where he remained until this past September when the Phillies decided not to renew his contract. After taking over the Phillies following their 2008 World Series, Amaro oversaw their slow and painful demise. By the end of his tenure in Philadelphia, the City of Brotherly Love had no love for Amaro, which likely had something to do with the fact he was considered by many to be one of the worst GM's in baseball. Amaro has no coaching experience at any level. Although a lack of experience is not disqualifying for anyone interested in becoming a first base coach, it is clearly an important consideration across the league since no other team has a first base coach with no prior experience as either a coach or infield/outfield instructor. However, based on recent trends, it appears teams are no longer considering only those candidates with the more traditional coaching background. As to who should be the next first base coach for the Boston Red Sox, while experience is a plus, the most important quality of any prospective candidate is their ability to fit in with John Farrell and the rest of the coaching staff. By all accounts, they are a very close-knit group, whose bond was strengthened following the difficult times they spent together coaching the team in Farrell's absence. Therefore, it is critical whoever they hire not disrupt what has been built within the coaching staff. 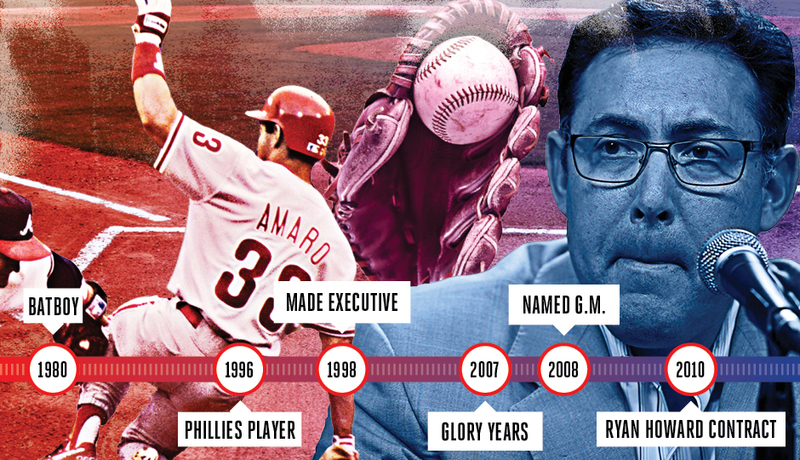 Ruben Amaro Jr. a manager? Bob Lamonte, the premier agent for NFL coaches and executives, has taken on a new baseball assignment — remaking the former Phillies GM. Lamonte, who has remade the careers of NFL coaches such as John Fox, Andy Reid, and Jack Del Rio, and transformed Jon Gruden from NFL coach to ESPN star, is now working with the 50-year-old Amaro and trying to sell him as a GM or manager. Amaro, who spent most of his eight seasons with the Phillies as their GM, would like to manage, and with the Marlins breaking that barrier with Dan Jennings stepping down from the front office to the dugout this season, Amaro, a Stanford graduate, appears serious about the challenge. Amaro is not the first front office executive to have such a high opinion of himself, and a low opinion of what it takes to be a successful MLB manager, but it is yet another red flag in his candidacy. This report also confirms what many believe is Amaro's worst quality: his ego. It was his ego that allowed the Phillies to go from World Series champion the year before he became GM, to the National League's worst teams in his final year as GM. Whether or not all the stories that have been reported about Amaro over the years are true, the fact they exist should be a cause of concern, especially when combined with the fact he has no prior coaching experience. It is one thing to take a chance on a player because he has the potential to hit 30 homers and drive in 100 runs. It is quote another when it is a prospective first base coach. Hopefully, Rob Bradford is right and the Red Sox have other finalists they are considering as well, as I am sure there are plenty of other strong candidates, many of whom may have prior coaching experience, and almost all of whom do not think the job they really deserve is the manager's job, and actually believe that. As it relates to Amaro's candidacy, the Red Sox must to get to yes on the following questions before hiring him as their first base coach: is he comfortable taking orders after not doing so for the last seven years; is he going to be able to go from the number one spot in the front office to the lowest spot in the coaching staff; is he comfortable going from the spotlight to being seen, but never heard; has changed since his time in Philadelphia, where he was known for his stubbornness and his ego, which often got in the way of doing what was best for the team; and is he truly capable of not only accepting a decision by Farrell that he disagrees with, but also fully buying in to Farrell's decision so he can effectively communicate it to the players. I would offer the job to bullpen coach, Dana LeVangie, who has been a loyal member of the Red Sox organization for 24 years. 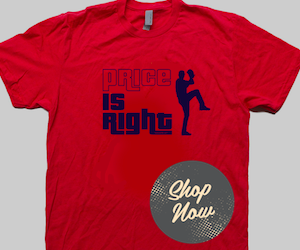 Prior to taking over the bullpen in 2013, he spent eight seasons as one of the Red Sox' Major League Advanced Scouts. LeVangie is also the team's catching coordinator. 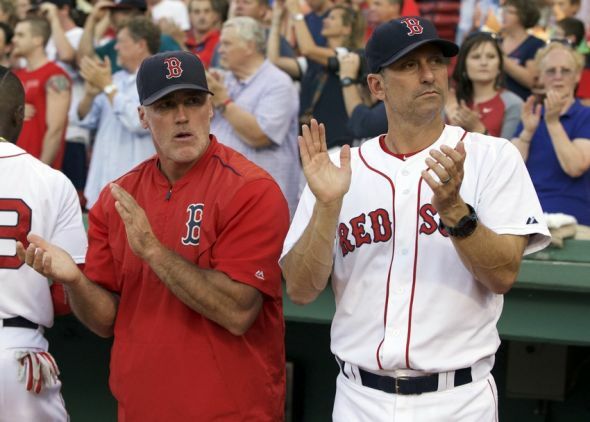 As some may remember, when Farrell took his leave of absence last year, bench coach, Torey Lovullo moved to the manager's role, and LeVangie took over as bench coach. 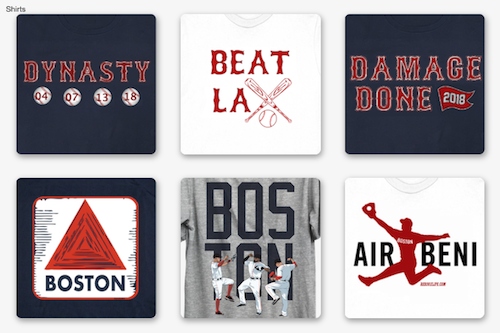 With them holding the top two spots in the dugout every night, during what was an incredibly difficult time, the Red Sox played their best baseball of the season. It was that performance that formed the basis for the Red Sox extending Lovullo with enough of a raise to convince him not to pursue the many managerial openings around the league for at least one more year. What about LeVangie? He was sent back to the bullpen, which was a mistake, but one that can be easily corrected. Questions for Readers: Would you hire Ruben Amaro as the next first base coach? Why?